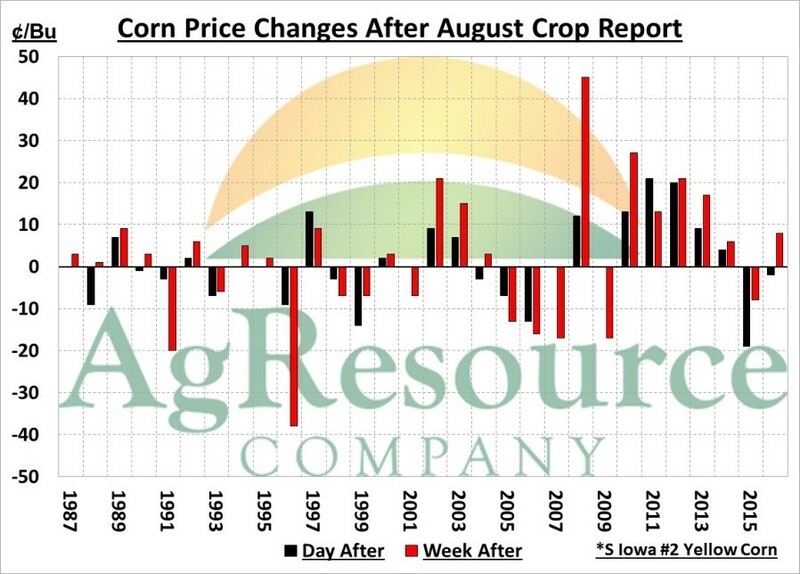 Like nearly all USDA Crop Report days, prices following such a key report tend to be volatile. On a percentage basis, corn cash and futures prices in the last decade have changed by an average of 2% following the August report! This implies a rise or fall of 8-10 cents tomorrow! Note that since 2007, there has been a bias for prices to be unchanged or higher (8 of 10 years) in the day following the report release, and in 7 out of 10 years the price corn has been higher in the week following. It’s the August yield versus the perceived pre report yield that drives CBOT price. Surveys of analysts this year have been in a wide yield range of 162-169 BPA, with the average guess calling for a corn yield of 166 BPA - right at the ARC yield forecast. Price changes in soybeans tend to be similar to corn on a percentage basis, but significantly greater in terms of $/bushel. In the last decade, soybeans have moved by an average of 2% in the day following the report’s release, and an average of 5% in the following week. This year prices can be expected to gain or decline by 15-20 cents in the day following, and be up or down by as much as 40-50 cents in the week following. 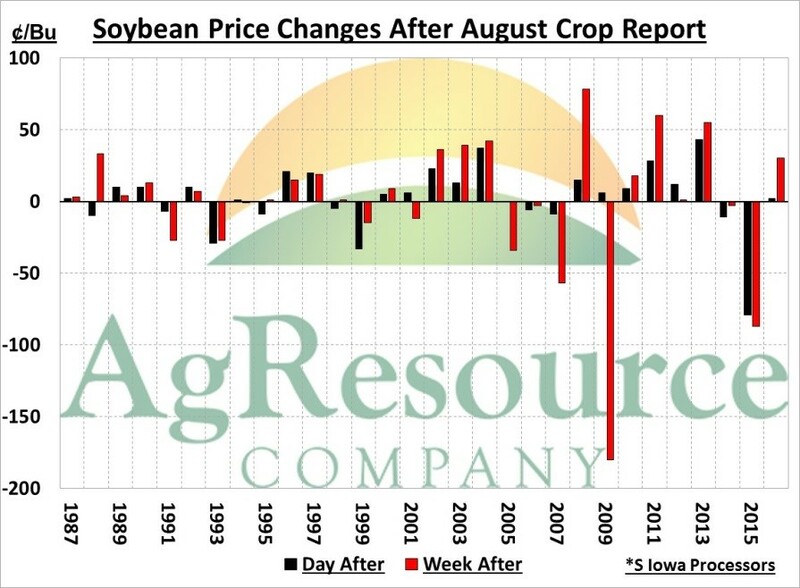 Like corn, there has been a tendency for soy prices to increase after the August crop report release. Since 2007, soybean prices have increased in 7 years and declined in 3 years in the day following the report. The week following has seen 6 years of higher prices and 4 years lower. Heading into the 2017 report, end users have limited forward coverage, while producers have been slow cash sellers amid low crop ratings and questionable yield potential. We also mention that already soybean stocks are likely to fall amid better than expected old crop export demand, and record Chinese imports in the month of July. There’s a strong tendency for changes in new crop soybean exports to follow changes in old crop, and so there’s a very real risk that 2017/18 US soy stocks drop to below 400 million bushels.